Will a Facial Steam Treatment Clear My Acne? You love facial steams—who doesn't? They feel amazing and leave your skin looking bright and glowing. You've also heard that facial steams cleanse out the pores, so can a facial steam clear up acne? Should you be steaming your face more often? You're not alone in your love of steaming the skin. The facial steam is a favorite feature of any salon facial, and personal facial steamers are extremely popular for at-home use. And many people steam their face the old-fashioned way, leaning over a bowl of very warm water covered by a towel. Too bad all this steaming doesn't actually cleanse out the pores! Pore blockages (called comedones) occur when oil and dead skin cells become lodged within the pore. This thick, sticky substance is the basis of every blackhead, whitehead, or pimple. Even hours of steaming won't clear this plug from the pore or stop new ones from forming, because they develop deeper within the pore. The steam, however lovely it feels, just billows around the surface of your skin. It never penetrates the pore where comedones form. That's not to say facial steaming doesn't have a place in skin care. Facial steaming can soften blackheads and non-inflamed breakouts so these blockages can be more easily removed from the pores. This is why during an acne treatment facial the esthetician treats you to a thorough steaming before starting with the extractions. Once the comedonal plug is softened, it can be coaxed from the pore with gentle pressure. Your skin care therapist should never try to extract an inflamed blemish, though. It will damage the skin. If you're super gentle and careful, you can extract some blemishes on your own at home. You can do so safely, without damaging your skin. 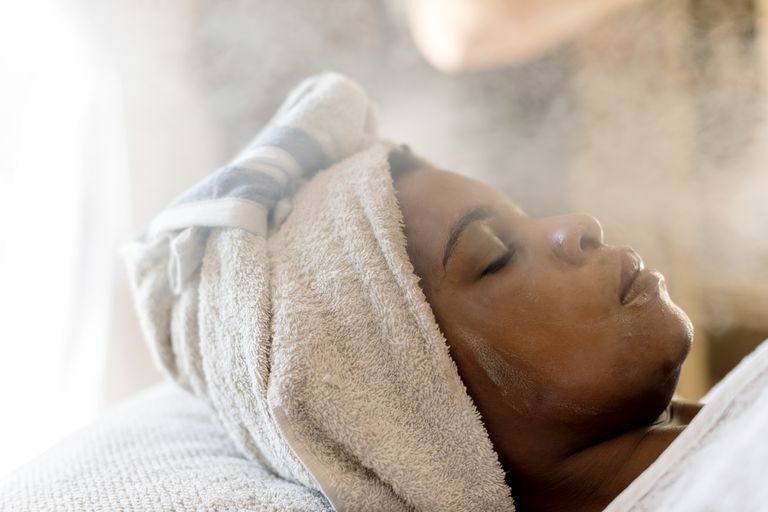 Besides prepping the skin for extractions, steaming also increases circulation, makes your skin look brighter and gives your complexion a rosy glow (temporarily, at least). And no one can argue that it just plain feels nice! While facial steams soften blemishes and makes them easier to extract, steaming alone won't clear up acne. Steaming and extracting helps remove existing pore blockages but, no matter how often you steam your face, it won't stop new breakouts from forming. So you'll always be playing catch up if you're using facial steams as your sole source of acne treatment. As for inflamed pimples, and especially larger blemishes like nodules and cysts, steaming won't have any clearing effect. You can't extract these large, deep blemishes, no matter how much you steam your face. In fact, steaming too often or using steam that is too hot can actually make inflammatory acne look worse because it increases redness and inflammation. If you love steaming your face, and it doesn't leave your skin too red or irritated, go ahead and enjoy it. But know steaming in itself is not a cure for acne. Instead, you'll be much better off using a topical treatment or oral medication to get those breakouts under control. For mild acne and blackheads, over-the-counter acne products may be enough to get your blemishes under control. For moderate breakouts to severe acne you'll need a prescription acne medication, so give your dermatologist a call. While facial steams can help minor pore blockages and blackheads be extracted, they aren't going to do anything to clear up an active case of acne. You can still enjoy your facial steams, but use them along with proven acne medications to get a real improvement in your skin. Zaenglein AL, Pathy AL, Schlosser BJ, Alikhan A, Baldwin HE, Berson DS, et. al. "Guidelines of Care for the Management of Acne Vulgaris." Journal of the American Academy of Dermatology. 2016 May;74(5):945-73.e33.